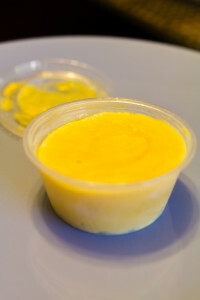 Mango Kulfi is a type of Indian Ice Cream that’s delicious and easy to make. Toast slices of white bread. Let it cool. Add bread to a blender and grind until it turns into little crumbs. Add the following to the blender: bread crumbs, mango pulp, heavy whipping cream, evaporated milk, and sweetened condensed milk. Liquefy. Add mixture to cups. You can use soufflé cups and their lids.